Step-1: Type your domain for which you required the support. Step-2: Enter your registered email id. Step-3: Enter your issue (Want to change NameServer for my Domain). Step-4: Click on "Want to Change/Update NameServer?”. Note: If the case is not suitable for your issue, again enter your issue shortly and click the suitable one. Step-5: You will receive a pin for verification to your email and you need to enter the pin to proceed further. Note: For security purpose, it's asking your PIN to avoid misuse this chatbot. The pin which has been sent to your registered email id is required for security purpose. Step-6: Again you need to confirm the domain name for which you need to change the nameserver. Step-7: You need to select how may nameservers you need to be updated, you can select 2 or 4 Nameservers. Step-8: Now you need to enter the nameservers one by one for which you want to change. Entering the nameserver depends on how many you have selected like 2 or 4 Nameservers. Note: When you purchase a hosting from us, we will send a nameserver to your registered email id. To point your domain name with our hosting, please get the nameservers from your email id. If you missed that email. Please refer below to get it using chatbot. Then retry to change from step-1. Finally, you would have successfully changed the nameserver for your domain. Usually, it will take up to 2 to 4 hours to apply the changes and you can check it after 4 hours. 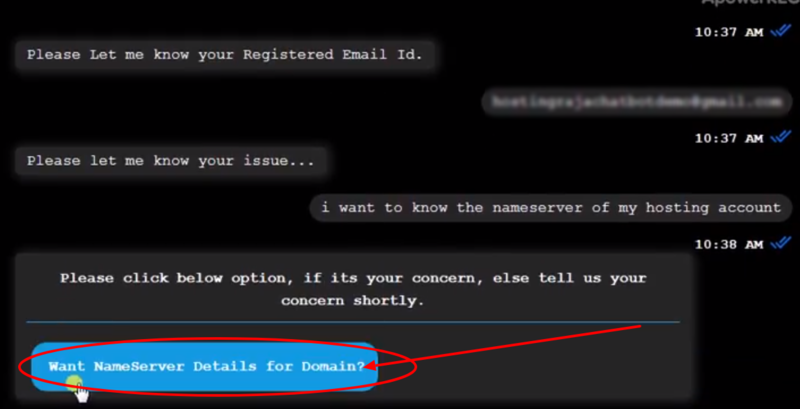 How to get nameserver of a domain in Linux shared hosting using Chatbot? Step-3: Enter your issue (I want to know the nameserver of my hosting account). Step-4: Click on "Want nameserver details for domain”. Step-5: After clicking the suitable case, it will display all the nameserver details whatever you are having with the hosting account of HostingRaja. 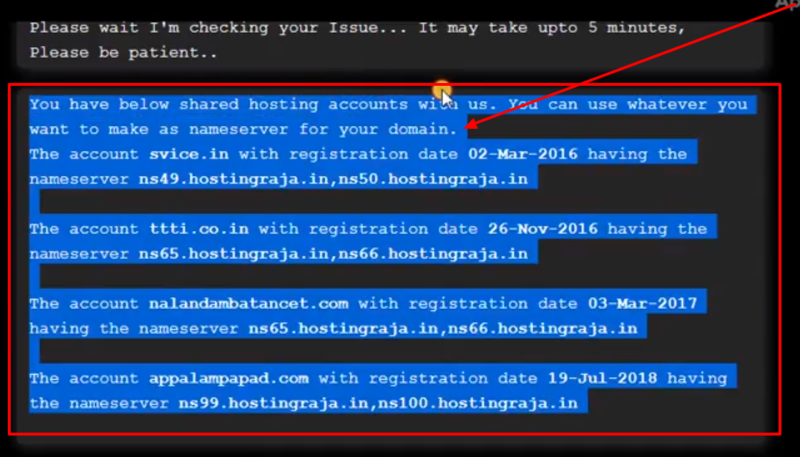 Finally, you will get the nameserver of the hosting account which you are having with HostingRaja using the chatbot instant support.